What a great shot! Tao you are a fantastic photographer, but this one is close to my heart... I always choose window seats to see the topography of the earth, especially over Colorado. I love the aerial view, (no pun intended). I am flying to Chicago in 2 days for my sister's wedding, and am looking forward to the plane ride, yay! 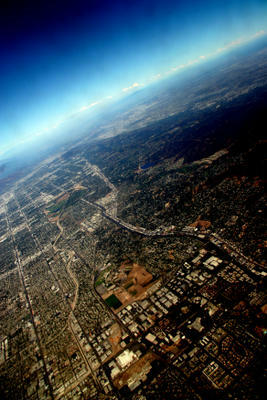 I love aerial shots, I think their great...the fact that your so far away and yet, so close. tao - u r some kind of talent; ALL your photos r truly amazing & to say one is better than another is foolish. HOWEVER, u know how i feel about urban sprawl and its l.a. - one great suburb, right? your shot goes on 4 miles & not a single high rise in site! but even so u do make it look great - who's side r un on?